This is our classic book on the JCL (Job Control Language) for the DOS/VSE operating system on IBM mainframes. After we published the second edition in 1988, though, it never made sense to update it. That’s because VSE systems always accounted for a small portion of the processing that’s done on IBM mainframes, and that portion went down dramatically in the 1990s. Nevertheless, much of the information in this book is still useful, especially in a historical sense. That’s partly because IBM prides itself on the upward-compatibility of its software. To find out how much applies to what you’re doing, please check the table of contents. DOS/VSE JCL is exactly what I needed. Steve Eckols has done an outstanding job of winnowing away the irrelevant, leaving a remarkably understandable and complete guide to the JCL our VSE shop needs to know." This book combines the information from more than a dozen IBM manuals to teach you what you need to know about JCL...and about your VSE system. It starts by explaining the basics of VSE...what it is and how it works...and describes some software products that aren’t part of VSE...like the spooling program, POWER, and the interactive editor, ICCF. Then, it teaches you how to: compile and execute application programs; handle all types of files; maintain VSE libraries and sublibraries; code POWER statements (JECL) to manage job scheduling and output processing; write and use procedures (that includes coverage of conditional JCL, symbolic parameters, and nested procedures); and run common system utilities. "Our entire staff has dog-eared this book reverently and lovingly." "Thank you for writing a book my employees can understand." "Help! Someone in the shop I’m working at liked my copy of your DOS/VSE JCL book so much that they “borrowed”‘ it from my desk and have not returned it. As a consultant, I can’t work without one of your books on my desk, so please rush me another copy." "DOS/VSE JCL is exactly what I needed. 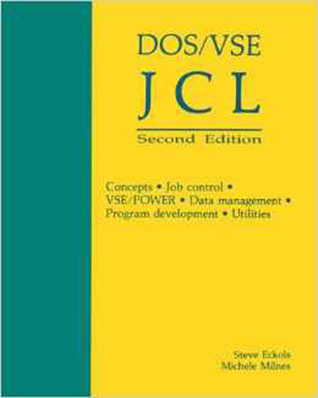 Steve Eckols has done an outstanding job of winnowing away the irrelevant, leaving a remarkably understandable and complete guide to the JCL our VSE shop needs to know."